Rio de Janeiro – World Sailing – It was a light and frustrating day for many in the Olympic sailing competition, but not for the London 2012 gold and silver medallists in the Men’s Windsurfer, with the Dutch and the British wrapping up Rio 2016 gold and silver before the Medal Race on Sunday. Meanwhile it was the start of competition for the Men’s and Women’s Skiff fleets, with an expected leader in the 49er Men, but a surprise leader in the 49erFX Women. 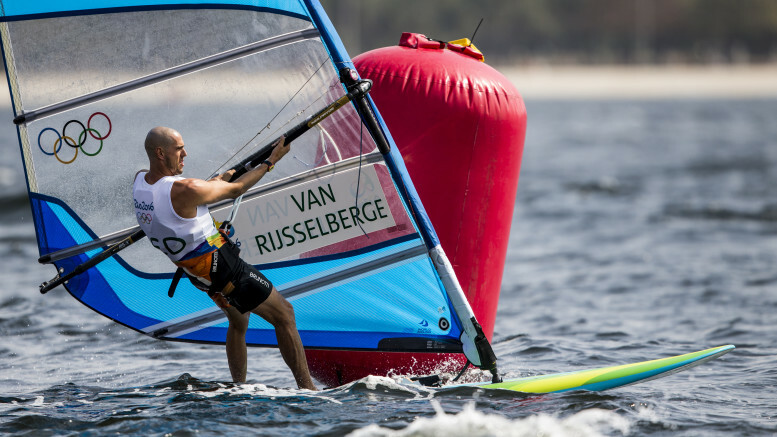 Dorian van Rijsselberghe (NED) has won the gold medal in the Men’s Windsurfer and Nick Dempsey (GBR) has won the silver, both without having to contest the Medal Race on Sunday. It’s a carbon copy repeat of London 2012 when the Dutchman took gold ahead of the Briton four years ago. The result is subject to protest, and both sailors will still have to sail the Medal Race, but van Rijsselberghe and Dempsey were already congratulating each other after crossing the finish line of the 12th race of their series. These two athletes have dominated the Olympic competition, with van Rijsselberghe winning seven of the 12 races and Dempsey winning three. Sunday’s battle for bronze will still be close fought between current World Champion Piotr Myszka (POL), Pierre Le Coq (FRA) and Byron Kokkalanis (GRE). Van Rijsselberghe paid tribute to the people that helped him to his second Olympic title saying, “The majority of it will be from Aaron, my coach. He keeps pushing me and of course my training partner Kiran Badloe and the others that have helped me bust my balls and blaze along.” He also thanked his wife for allowing him to shave his head specially for the Games, just as he had done when he won four years ago in London. Star performer of the day was Peina Chen (CHN) who won the last three races of the qualifying series. Just five points separate the top six sailors going into Sunday’s Women’s Windsurfer Medal Race this Sunday. Bearing in mind the final race is worth double points, Stefania Elfutina’s (RUS) one-point lead over Flavia Tartaglini (ITA) effectively puts them tied for first. Breathing down their necks are reigning Olympic Champion Marina Alabau (ESP), Peina Chen (CHN), Charline Picon (FRA) and Maayan Davidovich (ISR). A few points further back but still with an outside shot at the podium is Lillian de Geus (NED). Peter Burling and Blair Tuke (NZL) made the perfect start to their competition winning both opening heats in the Men’s 49er. After a long wait for the wind to settle on the Pão de Açucar (Sugarloaf Mountain) race course, it was Jonas Warrer and Christian Peter Lubeck (DEN) who found themselves duelling with the New Zealanders at the front of the fleet. Warrer, the 2008 Olympic Champion, looked to have got the better of the Kiwis on the final lap and was leading down to the finish when he belatedly realised he had missed out the gate mark. The Danes reluctantly but hurriedly dropped their gennaker to resail the course correctly, leaving the way clear for an easy opening victory for Burling and Tuke. Warrer crossed in eighth, an expensive mistake that could cost him further down the line. There is no stand-out favourite for gold in the brand new Women’s Skiff fleet, and after day one of competition things aren’t much clearer. Of all the teams that might have been expected to be topping the leaderboard, few would have picked the Canadians. 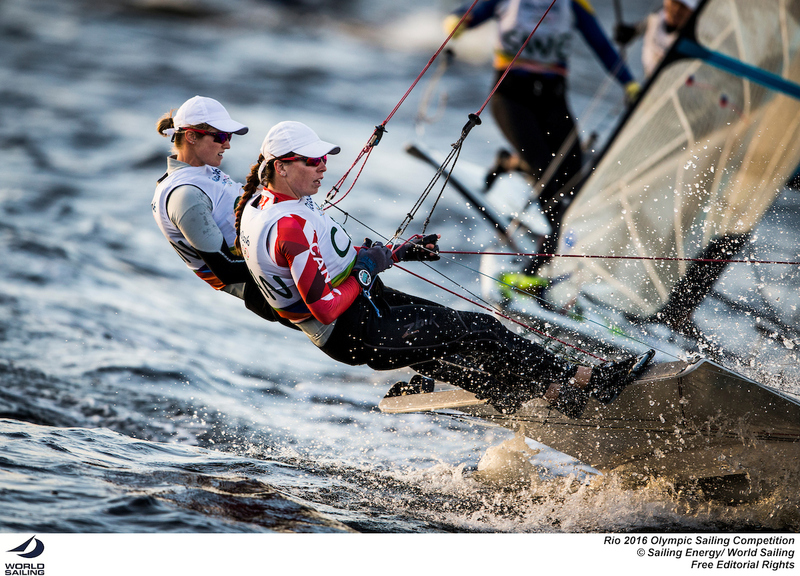 Yet Erin Rafuse and Dannie Boyd scored a 5,4 to hold a one-point lead over one of the acknowledged favourites, local sailors Martine Grael and Kahena Kunze (BRA), who won the second race of the day just as the sun was setting over their home town. Winners of the first race were Sarah Steyaert and Aude Compan (FRA) who are in third overall on equal points with last year’s World Champions from Italy, Giulia Conti and Francesca Clapcich. It was a frustrating wait for the 470 Men who were struggling to get in their races on the Escola Naval course. In the single race that was completed before sunset, Luke Patience and Chris Grube’s victory has lifted the British to third overall. The duel for supremacy continues between the reigning World Champions from Croatia and the reigning Olympic Champions from Australia. Mat Belcher and Will Ryan (AUS) moved to within two points of the lead after finishing second in the day’s only race, a place behind Sime Fantela and Igor Marenic (CRO) who lead the fleet. Panagiotis Mantis and Pavlos Kagialis (GRE) sit a point behind the British in fourth overall. Tonci Stipanović (CRO) gave away a lot of his lead in the Men’s Laser after struggling to get to grips with the unusual conditions out on the big rolling ocean. The Croatian could only manage 28,9 while Robert Scheidt (BRA) went on the attack with a 4,5 that has taken him to just three points of the lead. Tom Burton (AUS) is two points behind Scheidt in third overall.